You’ve heard me say it a few times already, but Fall is definitely my favorite season of the year! But it’s been such a weird Fall this year as we are in the middle of a MAJOR Indian summer with record high temperatures hitting 40 celsius! My Fall mums (plants) are freaking out as I’m sure they have NO clue what’s going with this heat! So with the unusual temperatures outdoors, I decided to embrace a non-traditional color palette for this Fall and I’m going PINK, BLUE, GREEN and PURPLE! As much as I love the changing colors of the trees outdoors, I haven’t been a fan of reds and oranges in my indoor home decor. 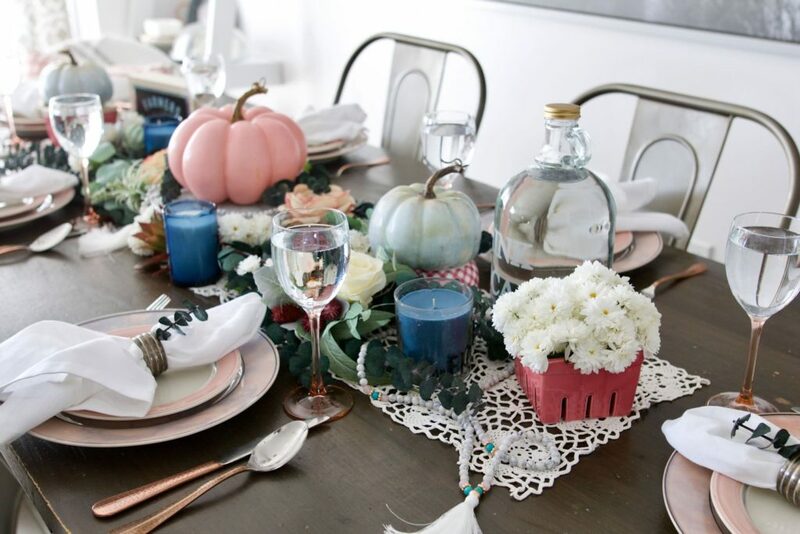 If you remember from last year, I went with all neutrals in my fall decor with whites, creams and light browns. 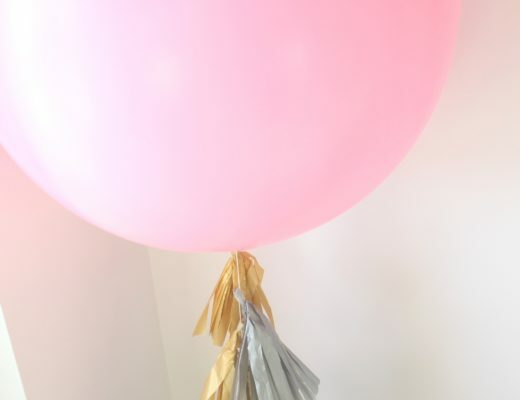 This year, I decided why NOT incorporate my favorite colors being pinks and blues?! I also wanted to add in some greens and then more purples in my front porch. I am like a smitten kitten with the way it all turned out and to be honest everything was really inexpensive. 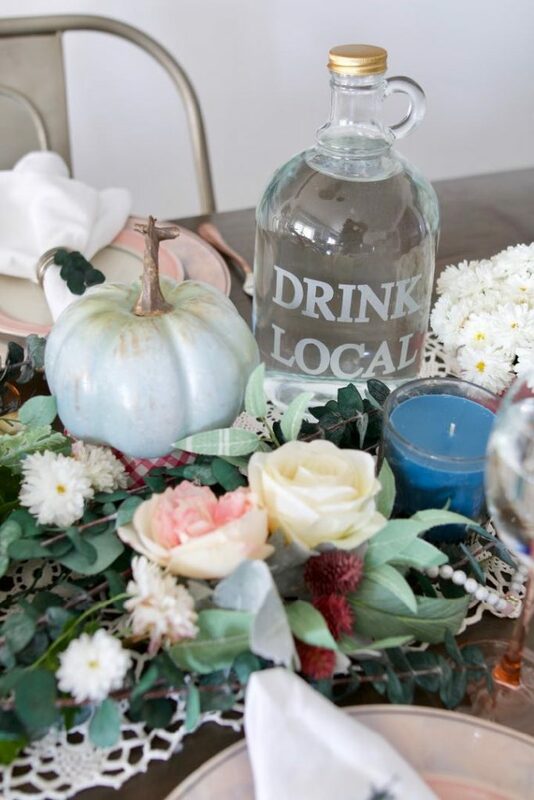 Let me talk you through the elements that made up both the tablescape and the front porch. 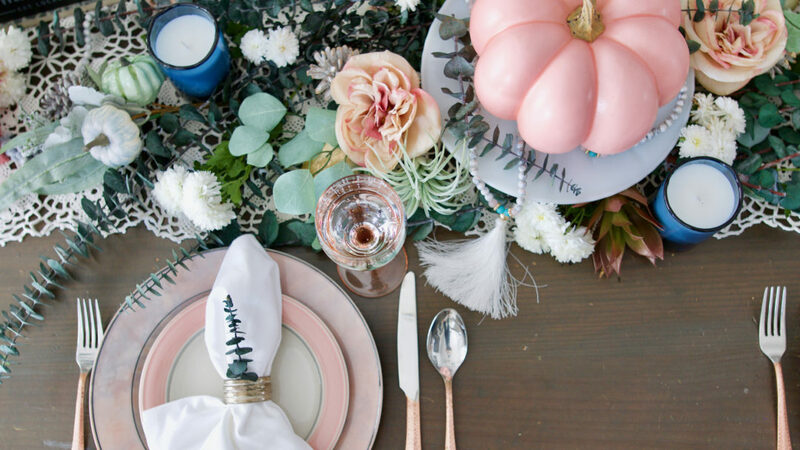 For the tablescape, the inspiration all started when I found these amazing pink and blue watercolor plates at the thrift store. I’ve honestly never seen anything like them before. There was a set of six plates for only $5! SOLD! So I knew after that, we were going pink and blue! I then found the smaller, pink rimmed plates at another thrift store for another $5. 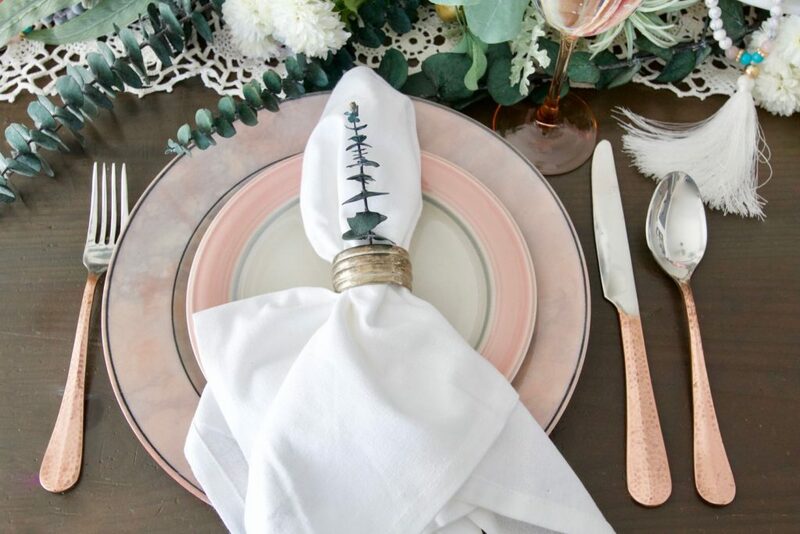 I already had the copper silverware and I knew they’d match nicely. I also stumbled on these gorgeous rose gold, pink stemmed glassware and I fell in love! They are a bit smaller than your traditional wine glass, but they were so pretty and perfect to use as a stemmed sparkling water glass! 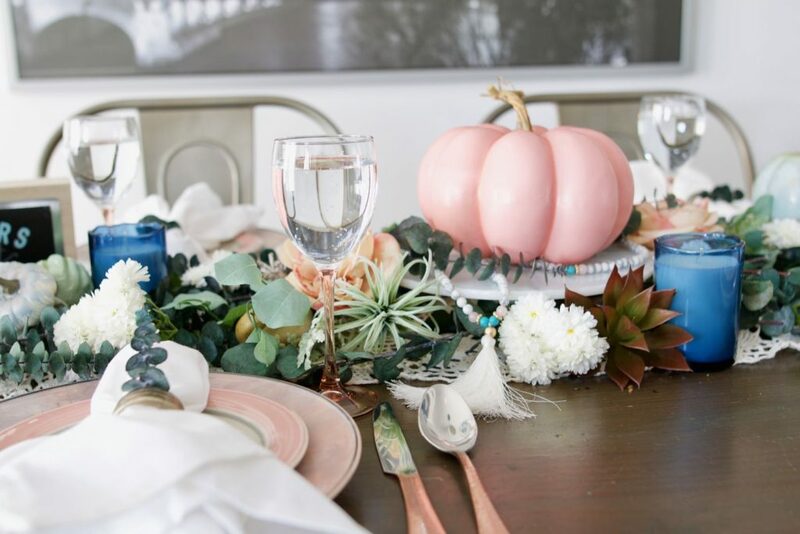 For the centrepiece, I found these pink and light blue pumpkins at Michaels, as well as the eucalyptus and floral picks. I love the deep bluey-green that the dried eucalyptus brings. For the remaining items, I shopped the Target dollar spot and clearance sections at the end of August, when we were in New York state camping. You know this Canadian momma has to stop ANYTIME she spots a Target (actually, if I’m totally honest, I looked it up on the map and we drove 30 minutes out of the way just to get to the Target…but totally worth it!) 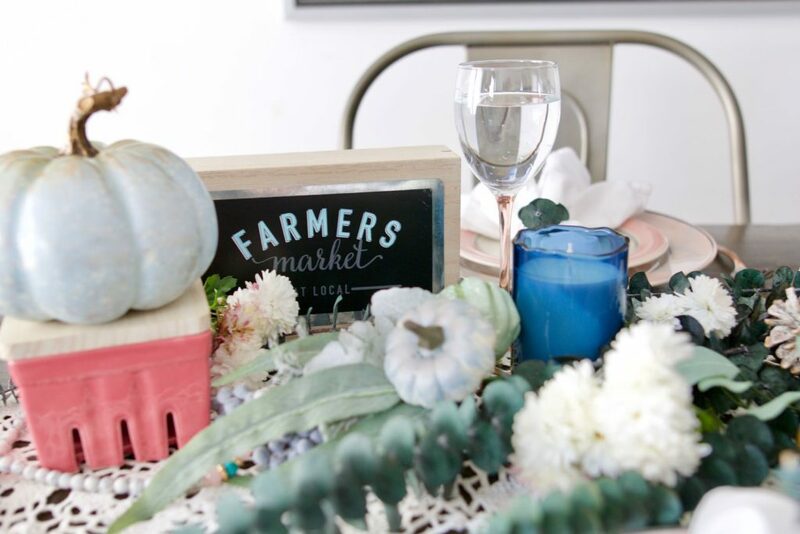 The fruit crates, drinking jar and farmer’s market sign were all in the dollar spot, each costing between $2-$5! The candles I found in the clearance section and just peeled the labels off the front. For the beaded tassel garland…well, those are actually necklaces!! 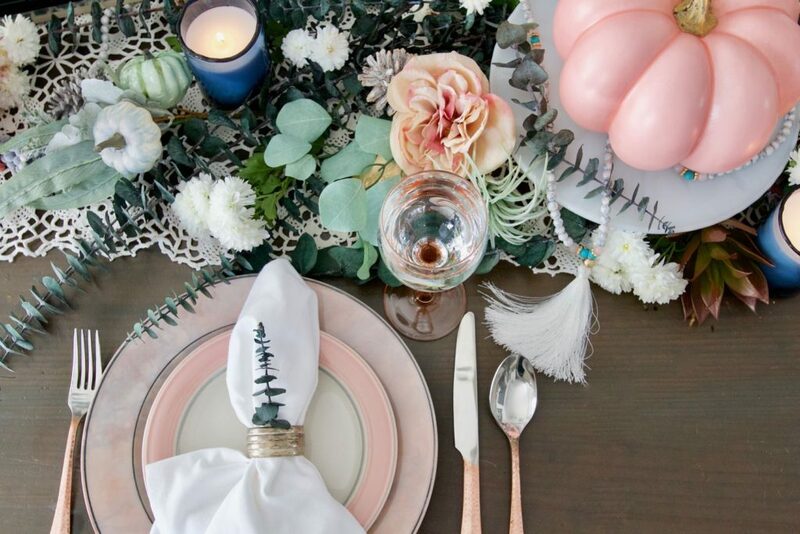 Again, I found them all half price in the clearance section, but I just couldn’t get over how cute and perfect they were to add into the tablescape! Let’s head to the front porch! 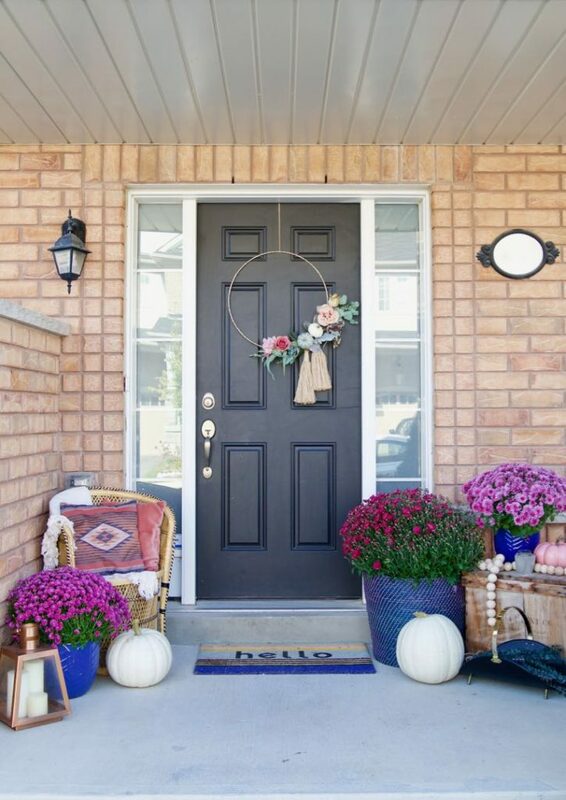 When it comes to decorating my porch for Fall, there will ALWAYS be Fall Mums! 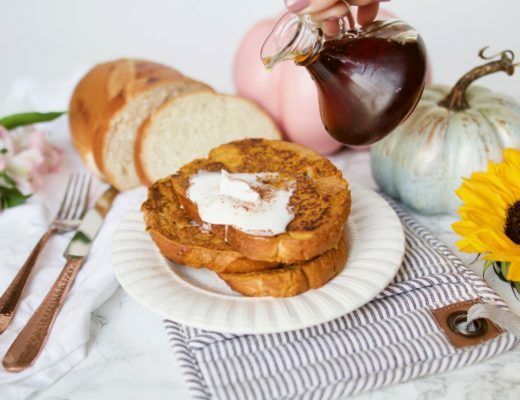 They are just so gorgeous, super hearty and are so inexpensive. They come in tons of different colors and because this year I wanted to go non-traditional colors, I picked out various shades of purples and deep pinks! I planted two of them in these gorgeous blue planters that I found at Lowe’s. The largest mum I placed inside a blueish-purple woven basket that I actually found at the thrift store for $7! It’s so big and completely changes the look of the plant! The doormat was a Target clearance find from this summer for less than $10. 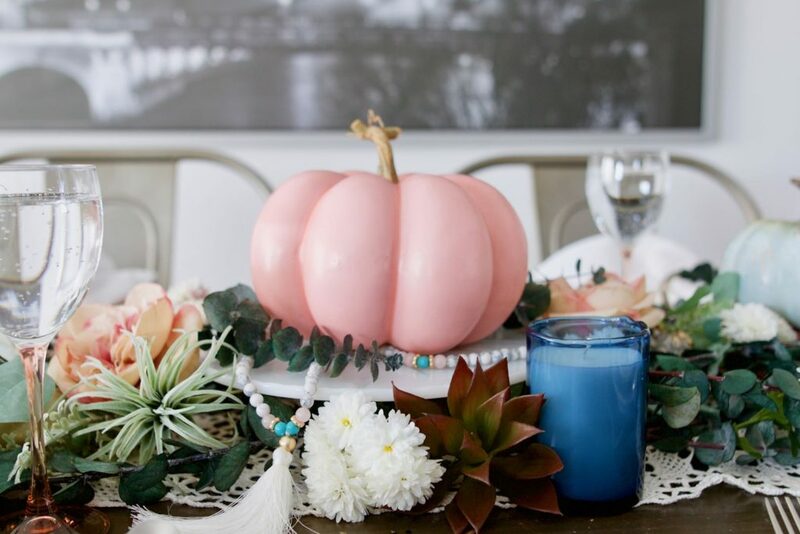 One of the benefits of decorating with non-traditional colors is that you can borrow items from previous seasons, which are often on clearance in stores, making the overall look very inexpensive! 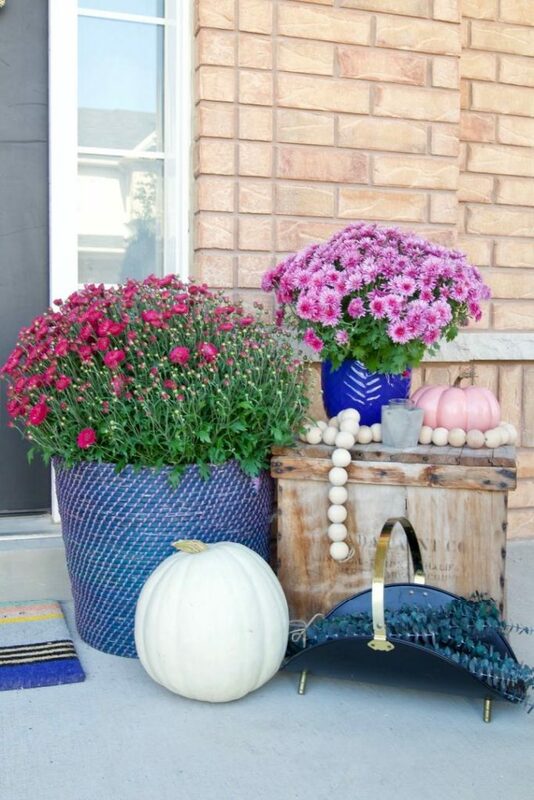 I absolutely love the mixture of all the different elements on this porch: wicker, porcelain, wood, cement, metal (brass and copper) and then the mix of faux plants and pumpkins along with real ones. It really adds in so many layers and textures that really are a feast for the eyes! I found this black and brass vintage log holder at the thrift store and thought it would make for an awesome flower holder. I had some extra eucalyptus from the tablescape, so I bundled those up and placed them inside the holder. I also made this very quick and inexpensive wood garland from balls I found at the thrift store as well. 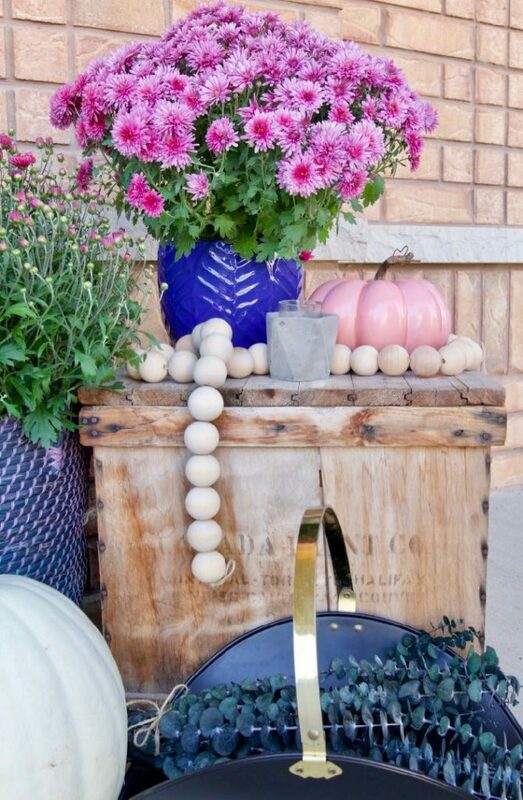 I’ve been seeing these garlands for the last year and could never find the right size wood balls. I ended up finding a few extra at LeeValley Tools to make this garland extra long! I absolutely love the way it turned out! Another favorite find of mine was this vintage wicker peacock chair with the low back. This was a STEAL at the thrift store for less than $10 (they sell these for over $200 on ebay…so keep your eyes peeled when you are thrifting!) I layered on a cream colored shawl with a tassel fringe and some vintage pillows, also from the thrift store to complete the look! I absolutely love the way it turned out! Finally, the wreath was another thrifted DIY that I made a few weeks ago. 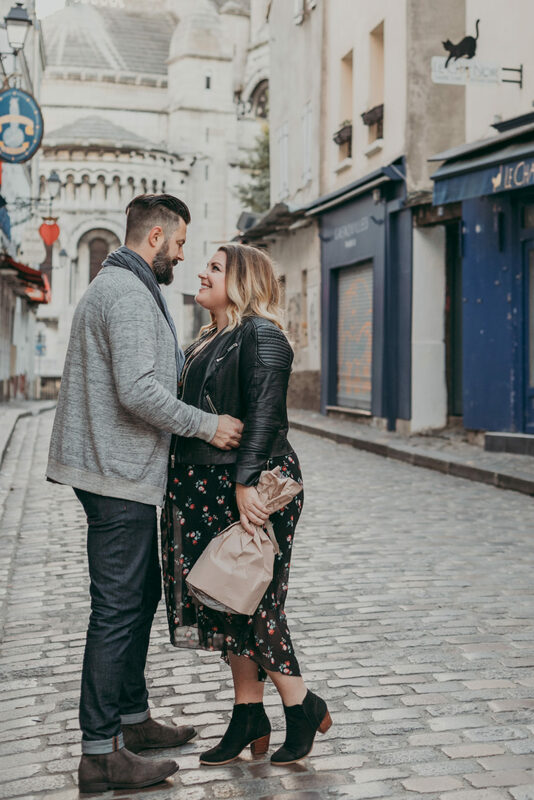 If you missed the post, you can check it out here! 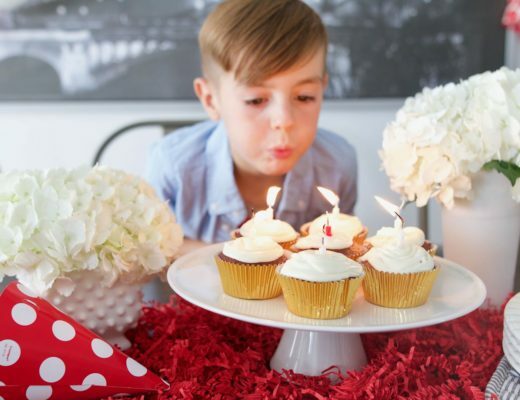 It’s super easy and inexpensive to make! 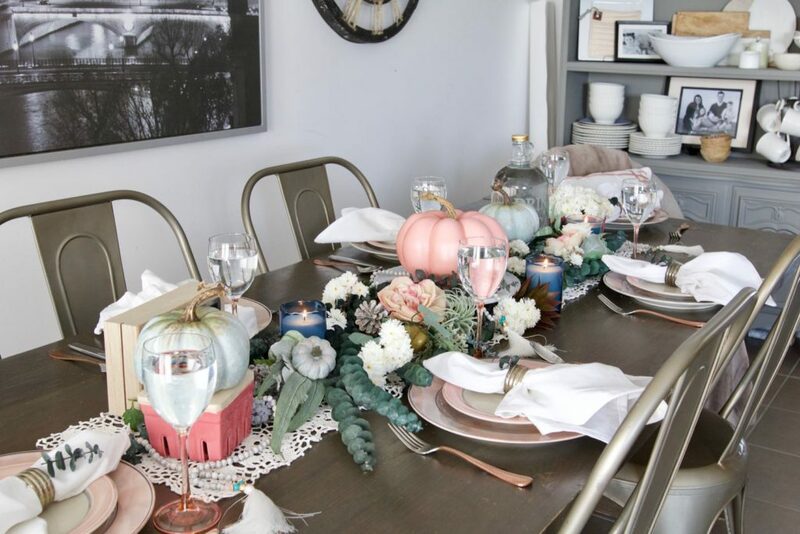 You can check out both the tablescape and the front porch on VIDEO below and here me talk through it all in a little more details! 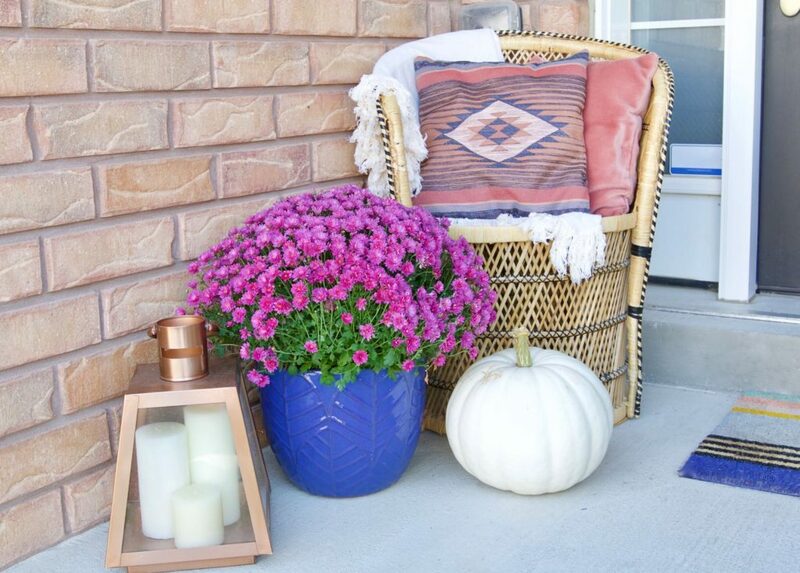 Also, don’t forget to check out all the other amazing Canadian home decor and DIY bloggers who are all participating in this Fall home tour below! 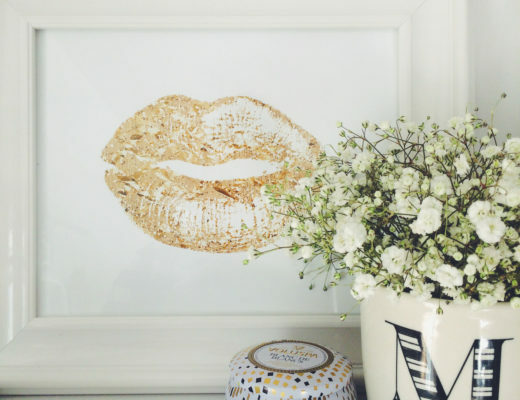 They are all crazy talented and you will be inspired by their fall decor! 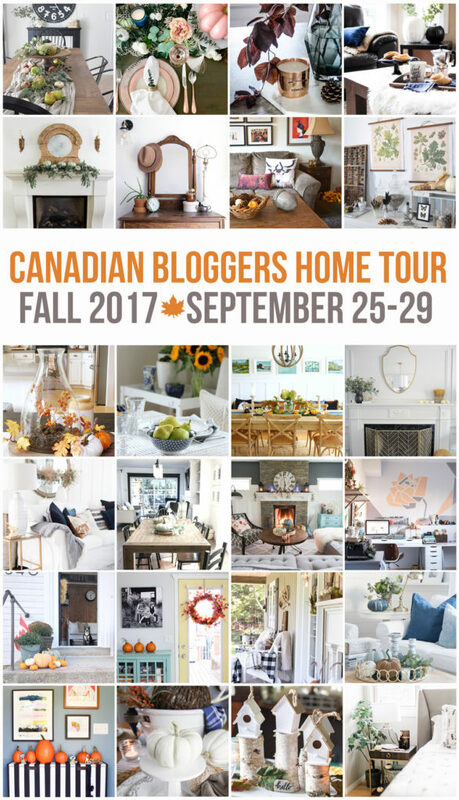 CANADIAN BLOGGERS FALL HOME TOUR! I love your use of non-traditional colours, and I LOVE your thrifting tips and the scores – man that’s awesome! 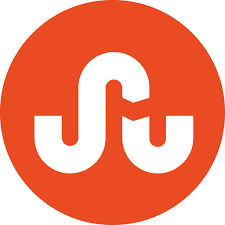 We’ll have to go hit the thrift stores one day! Beautiful tour – I’m off to find some pink today! Thanks Laurie! Let me know how you did on your thrifting for pink!! 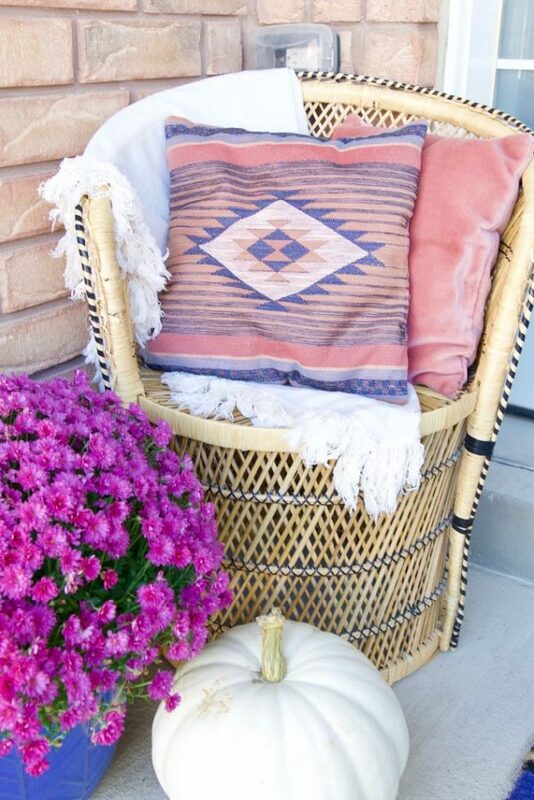 Your fall decor looks so very you! Love it! 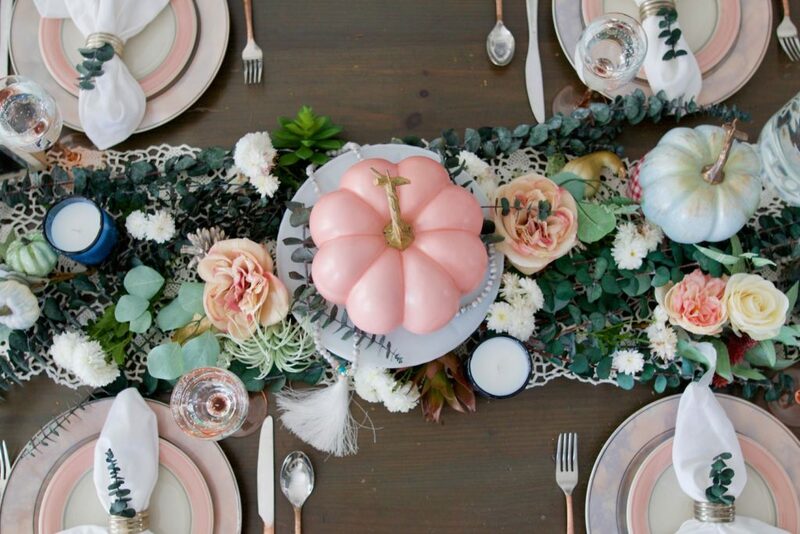 Love all the pinks and using non-traditional fall colors. So pretty! I absolutely love your colour scheme! Christine your table and front porch look amazing. I love, love all your thrifted treasures. And the pinks and blues are gorgeous! Great job. Beautiful Christine! 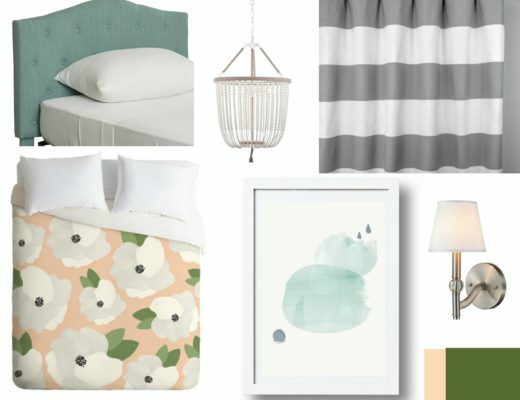 Love your non-traditional colour palette – very pretty and creative! SO pretty Christine! I think I’m in love with pink for fall!! Christine! 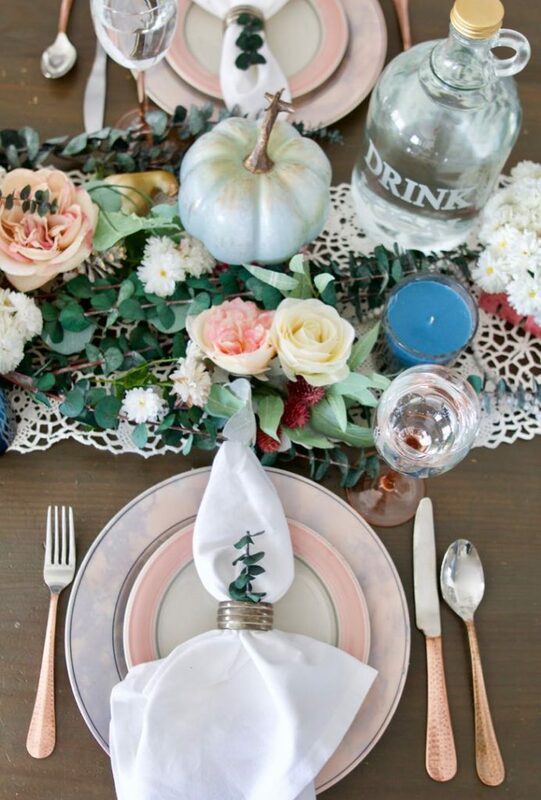 Your table setting is absolutely gorgeous- I love the colours!! 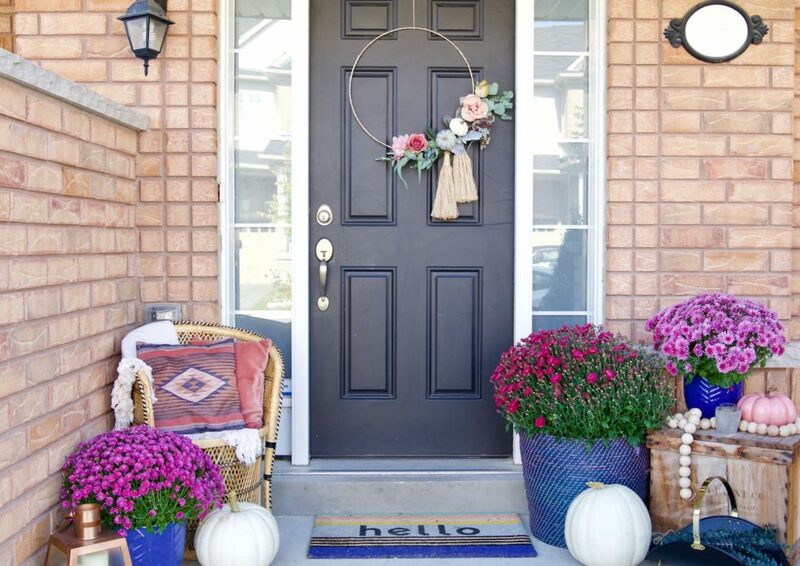 And your outdoor decor is so pretty and welcoming, as well!! Great tour! It’s so beautiful Christine! I love all the eucalyptus! They are and thanks so much Courtenay! This is so unique and beautiful, Christine! 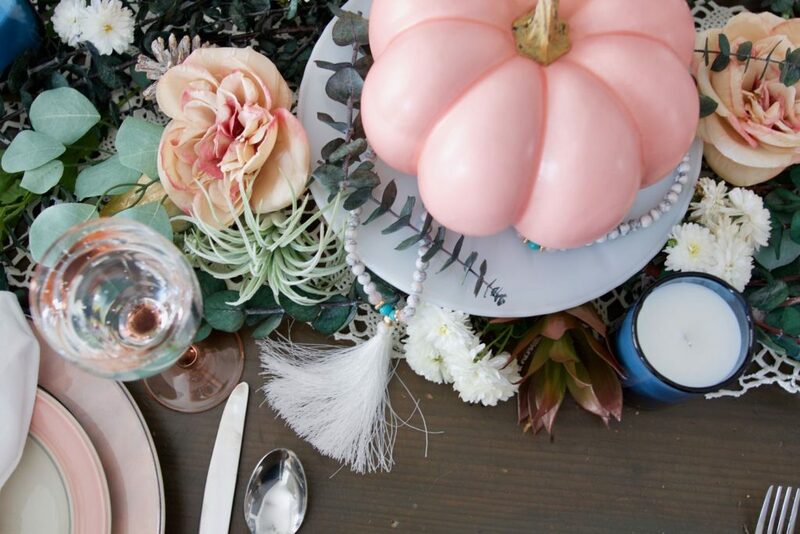 Of course I love the colour combo and the boho touches! Looks beautiful! 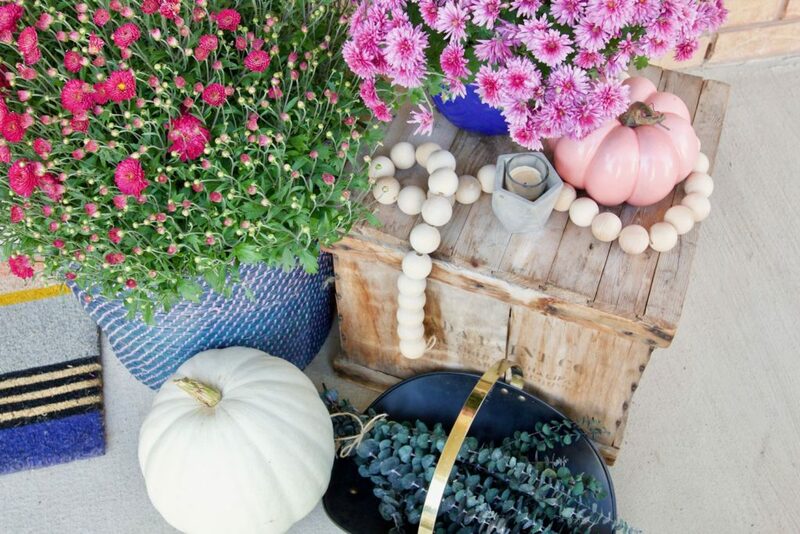 I love the blues and pinks, totally a combo I would have tried too!